I recently learned I was selected to participate in the American Association of Cancer Research (AACR) 2016 Scientist-Survivor Program! I’m excited to be attending the AACR Annual Meeting this April in New Orleans. Thanks to the Bonnie J. Addario Lung Cancer Foundation for sponsoring my application. I’m looking forward to networking with researchers as well as meeting advocates for other types of cancers to discuss their work. I’ll also be presenting a research poster on Lung Cancer Social Media (#LCSM) on Twitter, which offer a unique opportunity to connect with all types of stakeholders in the lung cancer community — patients, caregivers, healthcare providers, researchers, hospitals, pharmaceutical companies, advocacy groups, and insurance payers. Afterwards I plan to blog about the experience and share some of the exciting research presented at the meeting. After the meeting, I’m going to have a few days vacation to enjoy New Orleans (which I’ve never visited). I’ll then take The City of New Orleans Amtrak route to Chicago, followed by another train to Boston. I’ll arrive just in time to present at another conference (GET 2016) at Harvard the next day! I had originally planned to take the Sunset Limited from New Orleans to LA, but after I was invited to GET my travel coordinator (e.g., hubby Gerry) could not find any place where I could disembark along the way and fly to Boston in time for the conference. After GET, I’ll take a train to Washington DC, where I’ll be a speaker at LUNGevity’s National HOPE Summit. Whew! Glad I have willing housesitters who love (and are loved by) the cats. This entry was posted in #LCSM Chat, Advocacy, Lung Cancer, Patient Advocacy, Public Speaking, Research, Science, Travel and tagged AACR Scientist-Survivor Program, GET 2016, LUNGevity HOPE Summit. Bookmark the permalink. Wow! Sounds like an exciting time for you. And I can’t think of a better advocate out there for us lung cancer patients at these wonderful events. I am glad you get to mix some business with pleasure! My name is Mina and I am writing on behalf of Healthline.com. 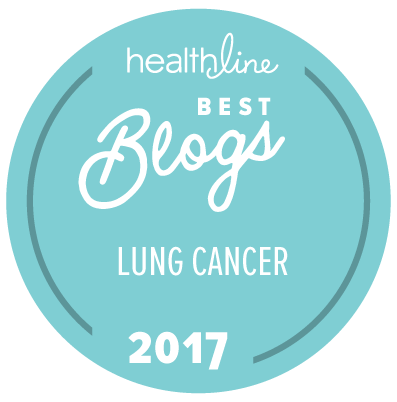 I found your blog through Healthline’s list of the best lung cancer blogs (http://www.healthline.com/health-slideshow/best-lung-cancer-blogs). Your blog is very nice and has a lot of helpful information. Since your blog has a great following and provides great insight into living with lung cancer, I am wondering if you would be interested in sharing a service with your readers that Healthline are currently offering. Healthline’s Opinion2 gives patients who have been diagnosed with lung cancer access to top oncologists, regardless of where they live. Patients and loved ones have the opportunity to get a crucial second opinion and the emotional comfort that may come with it. Please visit http://www.healthline.com/health/lung-cancer/second-opinion for more information. If you are interested in learning more about Healthline’s Opinion2, please feel free to reach out to me at mkwan@healthline.com with any questions.